The Telugu people across the world had woke up with a stunning news on the early morning of 6th January, 2014! As the new year jubilation and preparation for the forthcoming Sankranthi festival is lingering in the minds of the people, this early morning news created an unbelievable nightmarish experience to them. That stunning news is the HANG TO DEATH OF YOUNG HERO, UDAY KIRAN! 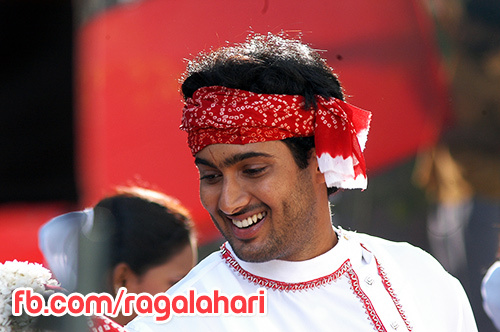 The Young Hero, UDAY KIRAN who carved his own niche in the world of Tollywood with the films like, CHITRAM, NUVVU NENU, MANASANTHA NUVVE etc and became the heart-throb of young audience overnight in the last decade. His passion for cinema, his dedication for acting had made him the Hero against all odds. He is neither from a filmy family nor from an affluent lot. But he became a success story of great inspiration for the youth aspirants at that time. Later, the things took place in his life did not worked in his favour and dabbled with series of failures. The Lady Luck had turned her face off and the name, fame, charm and success he enjoyed earlier had left him alone. The hero of 19 films in a span of 12 years had struggled hard to handle and continue the success he reached in the family-driven Filmdom of Tollywood. But finally, bowed his head to those ‘politics’ and got depressed and finally lost his life. The sudden unexpected demise of UDAY KIRAN not only gave a shock to Film Fraternity, but also gave a warning signal to the wannabe stars/artists! UDAY KIRAN might have done this as a ‘contempt’, but his last act in the frame of life, no doubt, had shattered the dreams of many filmbuffs! In general, the on-screen persona of the Hero is very strong and he can overcome any sort of problem and win over the unwelcoming situations in the story. But the Heroes in their real life behave just like the human beings, with all the emotions and feelings. Moreover, they are more senisitive and sensible than the normal people. That’s the reason, they prefer creative professions like acting /directing etc. That sensitivity had taken the life of the great director of all time, GURU DUTT, who committed suicide ! He is memorable with his films like, CHAUDHVIN KA CHAND, PYAASA, KAGAZ KE PHOOL etc. , which are classics on Indian Silver Screen! The promising hero, KUNAL of PREMIKULA ROJU fame, too committed suicide and bid adieu to his life abruptly! The celebrities and the heroines who committed suicide and put a full-stop to their lives are many-a-one in the history of filmdom! The actresses of yesteryears, SHOBHA, FATAFAT JAYALAXMI are few to name in the 1980s. The sudden suspicious suicides (?) of SILK SMITHA, DIVYA BHARATHI in the 1990s and the very recent death of Jiya Khan are all the examples of the streaks of sadness on the colorful world of show world. Everytime a star commits suicide, the sobbing stories of sorrows behind the beautiful smiles will resurface again! WHY THE STARS ARE BECOMING VICTIMS? To the common viewer, the life surrounding the film stars looks as glorious as gold with all the glitz and glam! very less people will be known about the work pressure, performance-phobia, success rate etc, of the stars, which can decide their fate. For that matter, every Friday is a testing time for the future of the stars! It is the common practice in the showbiz that, at times, the stars may shine like the sun and at other times, they may disappear under eclipse! High levels of uncertainty and fluctuations in career is USP of the life of any star! The star, who handles these obstacles with elan is becoming the survivor, while the other, who drowns himself in the flow, is becoming the victim, ala, UDAY KIRAN! However, the incident of UDAY KIRAN should become a lesson to all the Stars in the making and the established stars on one hand, and to the film fraternity on the other, to formulate a constructive program to initiate CONFIDENCE BUILDING MEASURES like psychological counselling etc. These measures will, to some extent, safeguard the lives of the Stars, from undesirable exits and will succeed in making up their minds saying, PICTURE ABHI BAKI HAI!